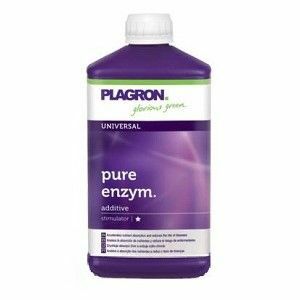 Plagron enzymes is an organic soil conditioner for the first five weeks of the cycle. Enzymes are responsible for the accelerated decomposition of dead plant parts. This accelerated degradation develops many extra nutrients and the micro life in the soil is stimulated. The vitamins in the enzymes ensure a healthy plant and gives protection against soil diseases. Enzymes are highly specialized protein molecules that are produced by fungi and bacteria. They act as accelerator (catalyst) of many biochemical processes in which molecules are converted. By using Enzymes cellulose and pectin groups of dead plant parts, such as roots, accelerated down very fast. They release many nutrients for the micro life and plant. Because the roots are supplied with nutrients from the surrounding micro life it gives encouragement of the micro life in the root environment by increased capacity of the plant. The micro-life increases the recording surface of the roots. A good root system has many young growth points. It is precisely in these growth points that there are elements such as calcium, magnesium and iron included. In addition, the micro life gives protection against attacks by pathogens. This enzyme preparation is essential for modern farming. Dosage: 1 to 1000, ie 1 ml solution in 1 litre of water.